The Garden of Gethsemane was chosen by Jesus as His last place of prayer during His final hours, and it was chosen by Judas as the place where he would betray Jesus. 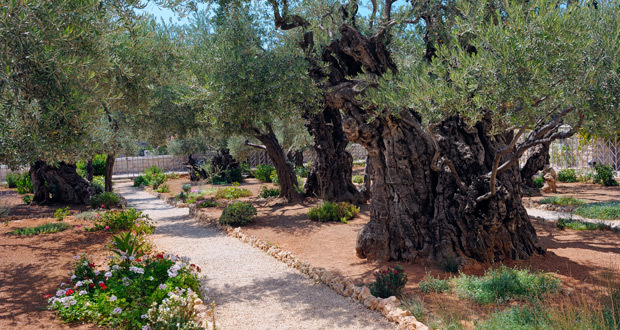 The Garden of Gethsemane now has 2000-year-old gnarled olive trees that may have been young saplings when Jesus came here with the disciples to pray. The garden in Jesus’ time would have been an olive grove where an olive-oil press was located (Gethsemane is a Greek form of the Hebrew gat shemanim ([olive] oil press.) Photo by T. Keener. Jesus sends Peter and John to prepare for the Passover meal. Jesus instructs them to follow a man and ask him about his guest room. 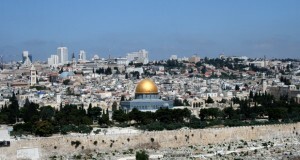 They head towards Jerusalem and locate the man who shows them a large upper room in his house and they begin the preparations. The Passover meal was to be eaten at night and to be completed before midnight. Peter and John probably go back to Bethany to get Jesus and the other 10 disciples and bring them to the upper room where they have the prepared meal. The Passover meal begins with the blessing of the wine. Sometime during the meal Jesus tells the disciples that one of them would betray Him. Judas was probably sitting close to Jesus, and since there were likely several dishes around the table, they would have dipped in the same bowl together. 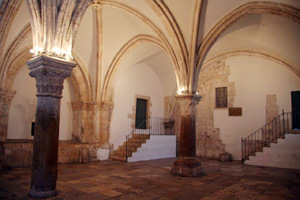 The upper room, also known as the Cenacle, is in the Franciscan Church of the Coenaculum on Mount Zion and is believed by some to be the official site of the Last Supper. 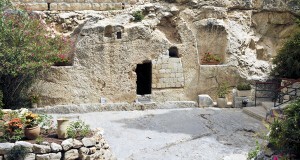 The Gospels do not mention the exact location of the Cenacle. However, the tradition, which dates to the times of early Christianity, puts the location on Mount Zion just outside of the Zion Gate. Photo by T. Keener. Jesus looks at Judas and tells him to do what he is going to do quickly. Judas leaves. At some point after this Jesus transforms the Passover into a new feast that symbolizes God’s deliverance to us from our sins. Perhaps it was after this that Jesus washes the disciples’ feet. The disciples were disputing who among them was the greatest and Jesus tells them that no servant is greater than his master. Jesus and the disciples sing a hymn together, possibly Psalm 118, and depart towards the Mount of Olives. Jesus tells them on the way that He will be with them only a little longer, and Peter wants to know where He is going. Jesus tells Peter that he will deny Him three times. You can only imagine what is going through Peter’s mind at this time. 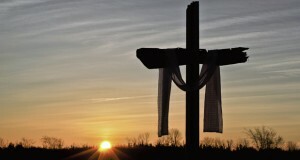 He probably can’t imagine ever denying Jesus. The disciples and Jesus go to the Garden of Gethsemane, outside the eastern wall of Jerusalem on the Mount of Olives. He asks the disciples to watch and pray with Him. While Jesus is talking to His disciples, a crowd appears with Judas leading them. Judas draws near to kiss Him and Jesus rebukes him. Jesus is arrested and taken away to appear before the chief priests and the whole council.